It’s no secret that a myriad of long-term problems facing our society are not effectively dealt with by our current system of government; indeed, many are simply set aside and disappear completely from the short-term political agenda. Why? Because they are ‘too difficult’ to solve. From immigration to welfare reform, from climate change to media regulation, the biggest issues consistently fall foul of the adversarial short-termism that afflicts our political culture. Too often, these seemingly intractable problems find their way into the ‘too difficult’ box: a burial ground for all the unpopular subjects that governments and their civil servants aren’t prepared to confront directly. The failure to address these fundamental issues, however, inevitably fosters cynicism about democracy itself. Former Home Secretary Charles Clarke argues that although change is difficult, it is sorely needed, and in some cases, time is not on our side. 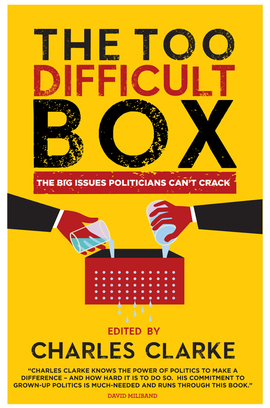 In The ‘Too Difficult’ Box he brings together a cast of heavy hitters from the worlds of politics, academia and public service, including Anthony Giddens, Hayden Phillips, John Hutton, Shirley Williams, Richard Dannatt, Margaret Hodge, Adam Boulton, Trevor Phillips, Patricia Hewitt and David Blunkett to write expansively and persuasively on some of society’s most insidious problems, too often kicked into the long grass because of their apparent insolubility. This is an important book... The 'Too Difficult' Box is vital to those who want to make a difference. Excellent. A very timely exploration... with some thought-provoking ideas about how we could do better. Mr Clarke and his distinguished contributors... give us case studies that make fascinating reading. A timely new book on big issues politicians cannot crack. Proactive and stimulating as an editor, Charles Clarke shows what a loss he is to the political world. [A]n illuminating series of essays. Clarke’s analysis is sensible and balanced. [An] accessible tour of 27 policy areas where governments struggle to make progress. Charles Clarke’s edited collection is an interesting read … Anatole Kaletsky’s [essay] on banking is especially fine.